Spicy blend of ginger, cardamom, cinnamon & clove A good metabolism booster brew Rich medicinal potency latte With subtle flavours of cardamom, cinnamon & clove, this extreme spicy mix of ginger will surely wake you up! This drink will make your day more exciting as it stimulates all of your senses. Throughout history, ginger has been valued for its nutritional and culinary capabilities. 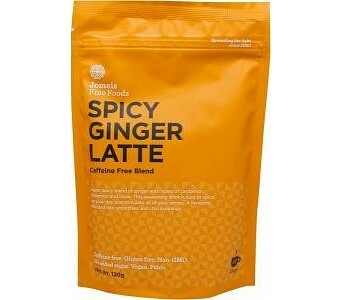 Aside from being spiced up, this Ginger Latte will also boost your metabolism and immune system. Perfect for also making spiced pecans! Ingredients: Ginger (40%), Cinnamon, Nutmeg, Black Pepper, Cardamom, Cloves, Coconut Milk Powder, Green Leaf Stevia (100% natural herbal plant extract).